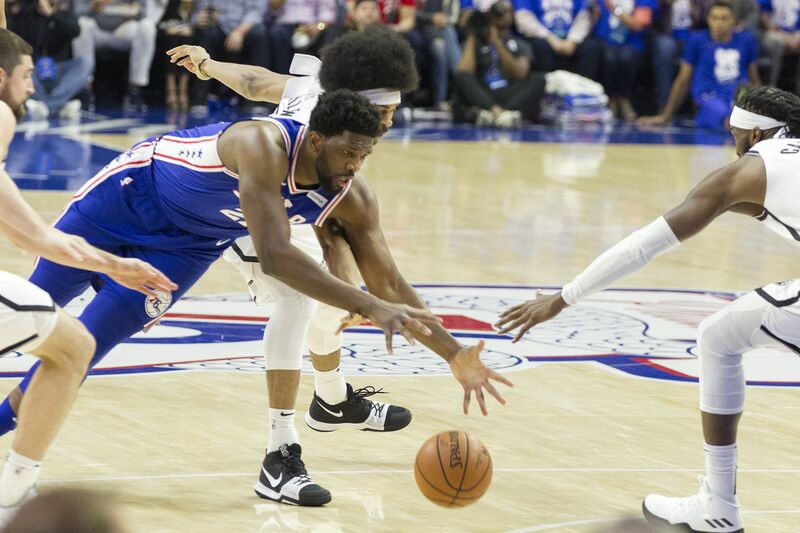 Joel Embiid, left, of the Sixers dives after a loose ball against Jarrett Allen, center, and DeMarre CArroll of the Nets during the 1st half of their NBA playoff game at the Wells Fargo Center on April 13, 2019. Stats, notes and quotes from Game 1. Plus, a little perspective on the Sixers awful shooting. The Sixers shot 3 for 25 from three-point territory in their Game 1 loss to the Nets. Some were shot in rhythm. Some were shot in a hurry. Some were wide open. Some were lazy. But 22 of them clanged off the Wells Fargo Center rims. According to the database at Basketball-Reference.com, it’s the third-worst performance by a team that shot at least 25 threes in the playoffs in the last 35 years. And it’s the worst by a team at home. This is based on percentage, so while the Sixers 12.0% is awful, that 15.9 percent Houston put up against Golden State in Game 7 of the Western Conference Finals last season was probably worse. The Rockets missed 37 of their 44 attempts that night. The Sixers shooters from three on Saturday were Jimmy Butler (1-3), JJ Redick (1-4), Mike Scott (1-8), Jonah Bolden (0-1), Tobias Harris (0-2), Jonathon Simmons (0-2) and Joel Embiid (0-5). The five worst performances in a postseason game since 1983-84 entering Saturday. >>1996 -- Chicago shot 3 for 26 (11.5%) in a loss at Seattle in Game 5 of the NBA Finals. Two nights later, on Father’s Day, the Bulls won the series as Michael Jordan let out a tidal wave of emotion. It was Jordan’s first title since his father’s murder in the summer of 1993. >>1997 -- Miami shot 3 for 26 (11.5) in a loss at Chicago. The Heat lost the series in five games and Jordan would go on to win his fifth title. >>1995 -- The Lakers hit just 4 of 28 (14.3%) in a Game 1 loss at Seattle. They rebounded to win the next three and win the five-game series. >>2018 -- The Spurs made only 4 of 28 (14.3%) at Golden State in Game 2. San Antonio was overmatched and lost the series in five. The Warriors went on to win their third championship in four years. Key stat: The Sixers were 0 for 9 on three-point shots. Joel Embiid, a 30 percent shooter from three during the season, missed all four of his attempts. Why it mattered: The Nets were able to get out in transition thanks to all the bricks. Brooklyn closed the quarter on a 12-0 run and the natives at the Wells Fargo Center voiced their displeasure. Quotable: “I’ll point exclusively to fatigue,” Sixers coach Brett Brown said of Embiid launching so many threes. “It’s a lot easier to run three-point line to three-point line than it is rim to rim." Key stat: Jimmy Butler had 18 points in the quarter. Why it mattered: With Embiid limited to just three minutes in the quarter and JJ Redick and Ben Simmons a combined 1 for 9, the Sixers turned to Butler. He hit a three-pointer at the halftime buzzer to close the deficit to eight. Would it be the boost the Sixers badly needed? Key stat: D’Angelo Russell scored 14 points on 6 of 10 shooting. This was the first postseason game of his career and he was miserable in the first half. Why it mattered: Jonathon Simmons missed a three-pointer that would have given the Sixers the lead. Russell countered by scoring 11 points in the next five minutes to give the Nets some breathing room. Key stat: JJ Redick fouled out for just the second time all season. He finished the game with more fouls (6) than points (5). Redick and Tobias Harris were both 2 for 7 from the field. Why it mattered: The Sixers shot 3 for 25 from three-point land, while the Nets shot 11 for 26. Quotable: “Slowing down JJ and Tobias was a big part of our gameplan,” the Nets coach said. Harris is now 0-5 in playoff games in his career.